Boston – Officials from the Boston Public Health Department confirmed that 80 students have become ill with norovirus after eating at a Chipotle restaurant near campus the past week. The students reported severe stomachache, vomiting and diarrhea. They are now being tested for E. coli and norovirus, as both cause symptoms describe by the students. 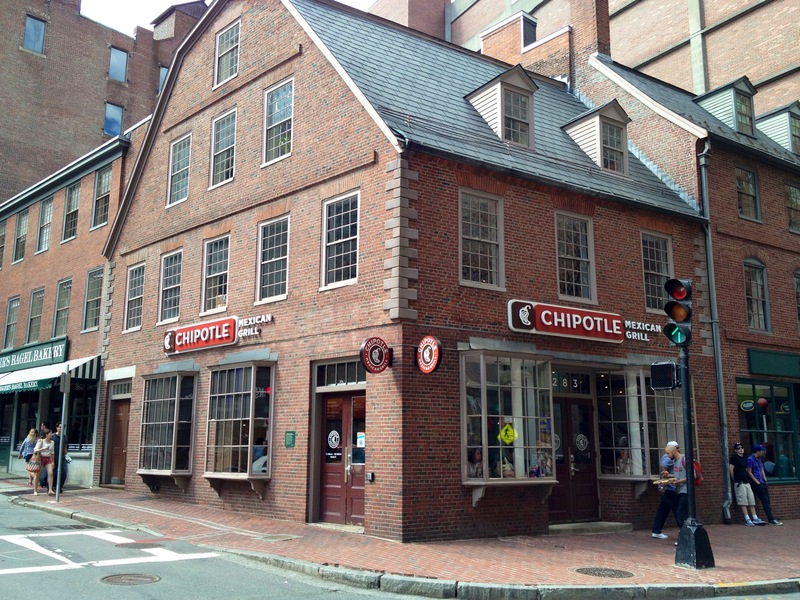 The historical site of the Old Corner Bookstore in Boston, Mass., which is now a Chipotle. Credit: Lakewood Mag. “All 80 students have confirmed that they ate at the Chipotle Restaurant in Cleveland Circle during the weekend,” Boston College said in a statement. The health department said in a statement that initial testing conducted by the State Public Health had shown the presence of norovirus. Even though the source of the outbreak has not been determinate yet s spokesman for Boston Collage said authorities focused on the Cleveland Circle Chipotle location. The restaurant is currently closed for investigations. The food chain said that no cases of E.coli in Boston have been linked to the company. Chris Arnold, a spokesperson for the eatery, said the company agreed with health officials that it is likely a norovirus, which seems very consistent with the pattern here. He added that it was important to note that noroviruses are very common. According to the CDC, there are approximately 20 million cases a year, making them the leading cause of gastroenteritis in the U.S, in part because they are so easily transmitted from person to person through contact, on surface areas, or through food or drink. This is the company’s third food safety incident since August. That month Norovirus was blamed for sickening nearly 100 people at a Chipotle restaurant in Simi Valley, California and on October 31st, it was linked to an E. coli outbreak that has sickened 52 people in nine states. Moreover, 8 players on the Boston College Basketball team confirmed to have E.coli just moments after Boston College’s university medical staff sent out a campus-wide email notifying students and faculty that there were numerous people on campus that had become sick from the Chipotle restaurant in Cleveland Circle. The food poisoning caused many players to miss yesterday’s game.